If you have tried some of our other slime recipes then you know we love to make slime here! 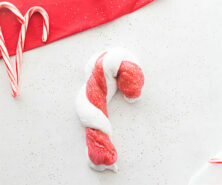 And slime can be a great non-candy gift idea for Valentine’s Day. 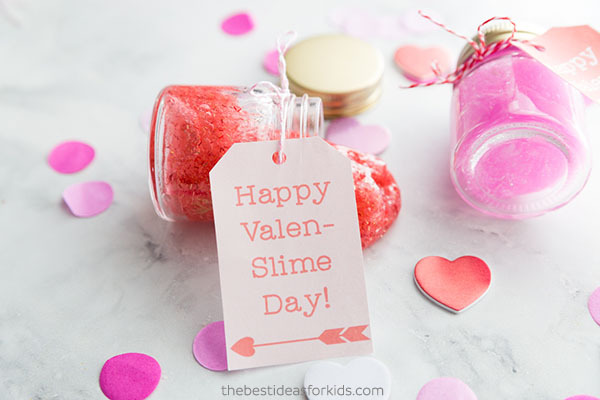 Kids can have fun helping you to make the slime and printing off these cute slime gift tags “Happy Valen-slime Day”. 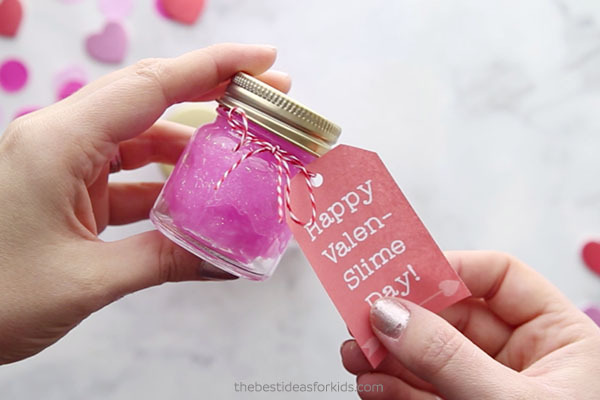 This Valentine Slime will make a great gift this Valentine’s Day! 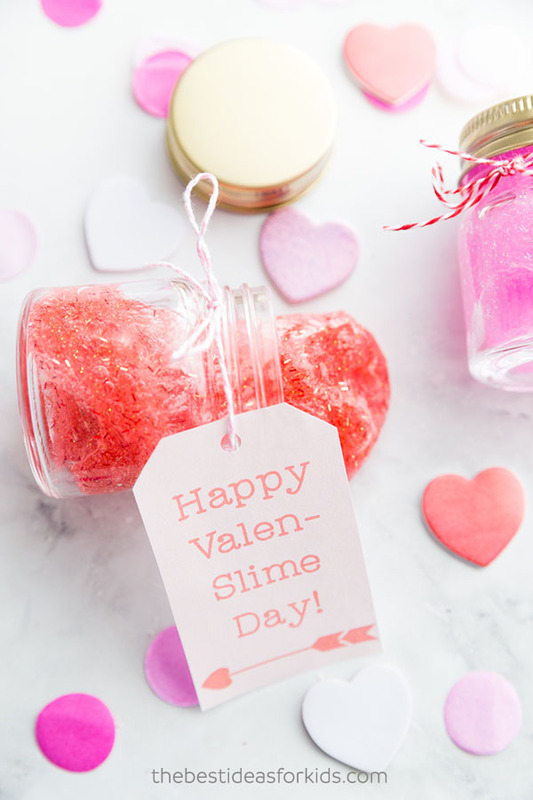 You can grab the free Valentine Slime gift tags at the bottom of this post. 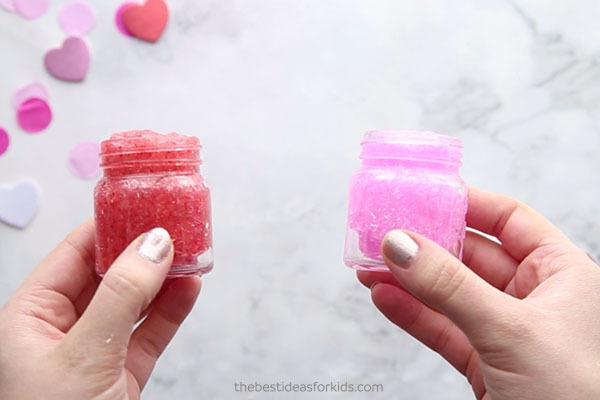 We included 2 colors to choose from – pink and red so you can decide which color slime you’d want to make. Or you can make both! We also included a slime safety tag to glue to the back of the tags. This is important if you want to hand these out to other kids as not everyone is aware of slime safety. Here is what the safety tip tag says: Slime Safety Tips! 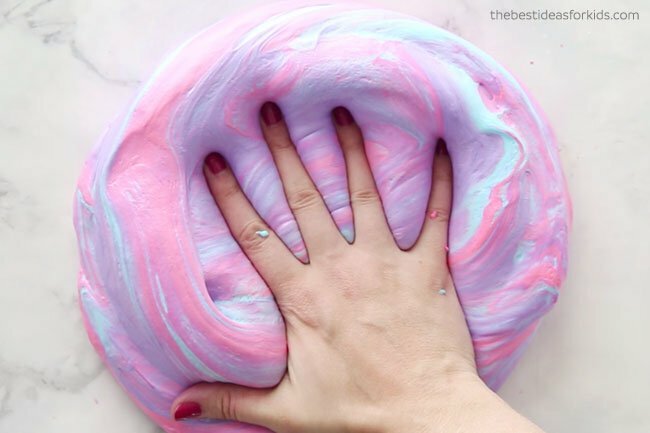 This is homemade slime made with love using glue, baking soda and contact lens solution. If you are sensitive to these ingredients, please do not use. Slime is not to be placed in the mouth and you should wash your hands after use. Adult supervision is recommended. Grab the free printable tags and slime safety tag by subscribing to our mailing list at the bottom of this post. – 1 Bottle of Elmer’s Glitter Glue (6 oz). We used red and pink. Note: We have only tested this with Elmer’s glitter glue and recommend this brand as other brands may not work. – 1 TBSP or more (up to 1 cup) water which will make your slime stretchier. We made two glitter glue slimes – this was the red slime. And this is the pink slime. Once you have both slimes made, you can fill your small mason jars. Depending on your size of jars you should be able to get 2-3 jars with one batch/recipe. We filled 2 small mason jars with one batch. Now add your gift tags with a little bit of twine wrapped around the jar! Adult supervision is recommended and slime should never be placed in the mouth. Adults should make the slime. 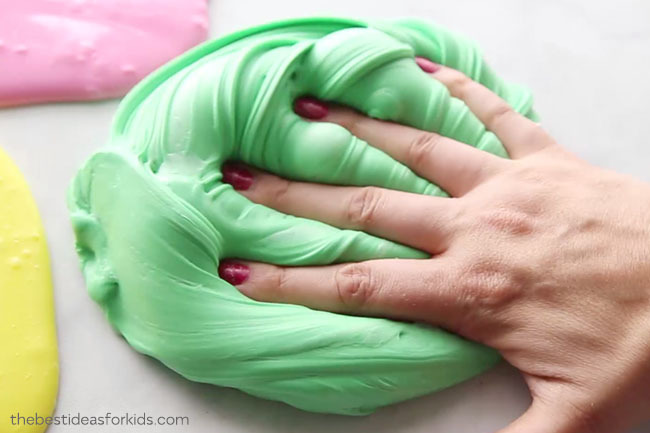 See the full recipe for more slime safety tips. 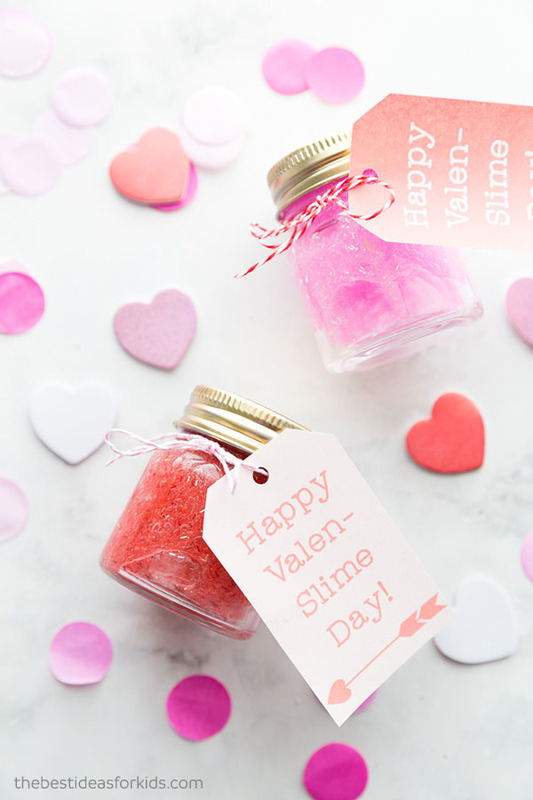 Sign up for our Newsletter and get this Valentine Slime Tags as a Thank You! If you are having trouble getting the email confirmation, make sure you check all folders as it can sometimes land in the promotion and junk folders. 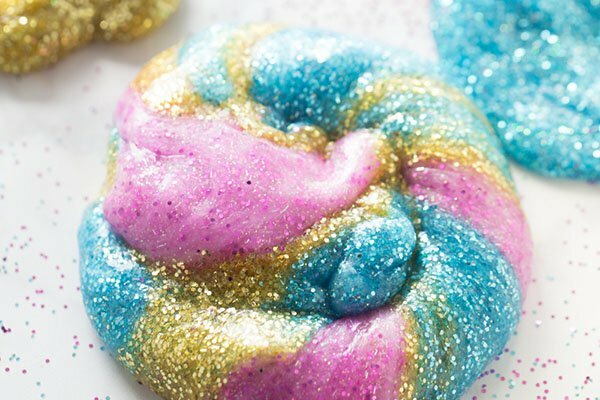 For more slime fun, see our Unicorn Slime Recipe. 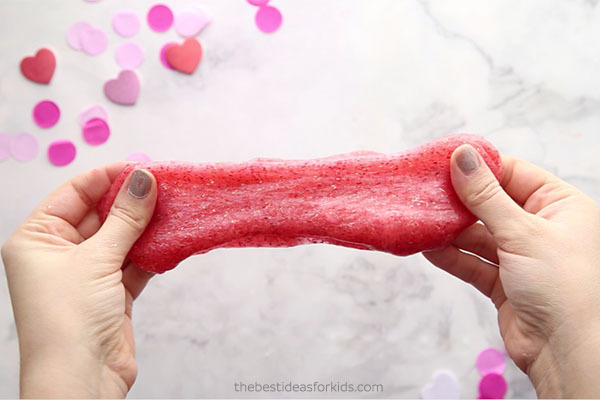 If you haven’t tried fluffy slime, you can make Valentine fluffy slime instead. 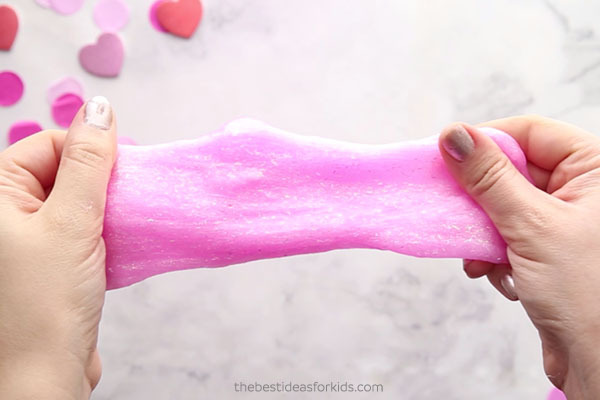 And for a different slime texture our butter slime is stretchy and fun to make! Hi Sarah, just subscribe above and it will send you a link to our resource library. Hope that helps! My daughter loves this idea! I’d like to get the link to our resource library with all of our free printables. Hi Michelle, just subscribe above and it will be emailed to you. If you have any issues reach out to us on our contact page. 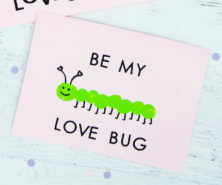 I subscribed to the email list but I’m not able to find the valen-slime tags under free printables. Am I looking in the wrong place? I am a nanny 2,3&5 year old loved making it and playing with it. Is there still a link to the Slime printable? Thank you! 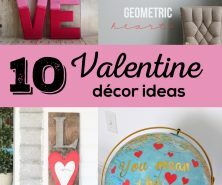 You just need to subscribe at the bottom of the post and you’ll get the link to our resource library with all of our free printables. Thanks! This looks like what my great granddaughter would love.